The lovely Wendy over at Wendy's Delights and I have been friends for a few years now, she's such a sweetheart. And when she knew it was my birthday she sent me a lovely gift including lots of goodies she knew I'd love including a fluffy pen, penguin themed card, stickers and of course nail polish. 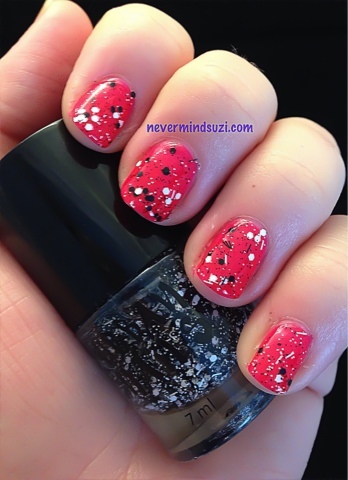 This polish duo features a pink/red creme and a black/white glitter top coat. Here's the red/pink on it's own. 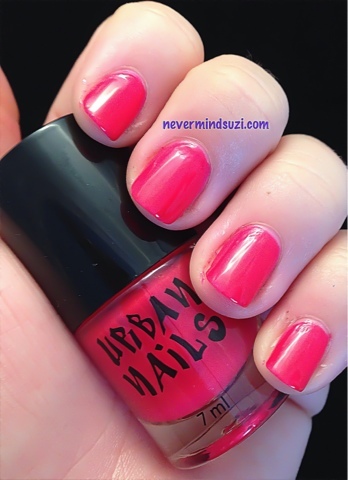 It looks red in the bottle but once on the nail it has this gorgeous pink undertone to it. I then topped it with the fab black/white glitter topper, doesn't it look great! Awww you're welcome, fab mani too babes!